In pondering what to choose to write for this post and in an effort to get things moving I just moved over to Scotts desk to change-up the energy a bit. Outside the window the finches are yelling at me because I removed the feeder – couldn’t take the pigeons dumping all over the balcony anymore. Besides, birds need to feed insects to their young to make their feathers grow (apparently), so I feel almost virtuous in cutting them off for a few days. The hummingbird is a bit different, if we take away the feeder he may never come back, they hate disruption, and now that hummingbirds are habituated to the city in the winter because feeders have been put up (we didn’t start it!) they need that consistency. I did, in an effort to provide some natural food source, plant a few hummingbird friendly flowers. Our little friend gave them a cursory once over then settled back to the crack cocaine of free, immediate sugared water. Bah. That was a brief segue. What I meant to say was that I recently re-watched Babette’s Feast, hard to believe it was made in 1987. And it was as wonderful to get lost in it as it was the first time around. A short story by Karen Blixen (Out of Africa) under the pen name of Isak Dinesen, it has some profound commentary on the creativity of an artist, in this case a cook. Babette says: ‘throughout the world sounds one long cry from the heart of the artist. Give me the chance to do my very best’ and that ‘an Artist is never poor’. Well, the last is true and not true of course. I’m going to digress again here and mention a great quote by Alan Rusbridger who just retired at editor of The Guardian in the UK. ‘It seemed obvious to me that journalism, as an imperfect medium, will always include mistakes……’ (Just in case I get any quotes wrong, I’m no journalist of course, but I do try to check and double-check the information I glean for these posts). I think perhaps many people try, if they have the luxury to do so, to find something that reflects who they really are. I don’t think it really matters, cooking, drawing, sport, reading, writing, being a good friend etc. I made a soup a couple of weeks ago. Just enjoying the feeling of making something new, and of making something, from my new favourite cookbook A Kitchen in France. (I’ve even taken to writing annotations in it which shows how much I like it, I have every intention of hanging on to it…..much like we used to do when we were kids, remember how you’d proudly write your name in your book? Never thinking that you wouldn’t always have it, the seeming permanence of childhood!). 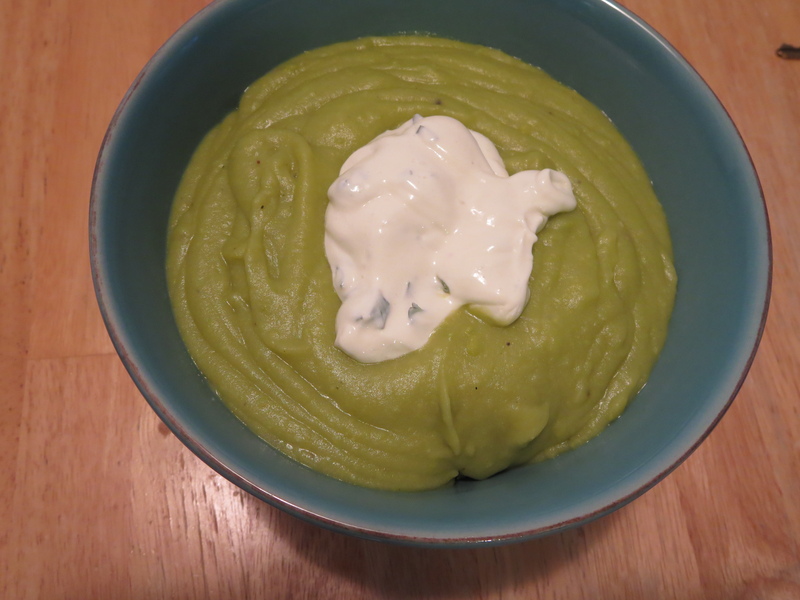 It was a fava bean soup, cue the inevitable quote, although fava beans are also known as broad beans. I may have misread the recipe initially. 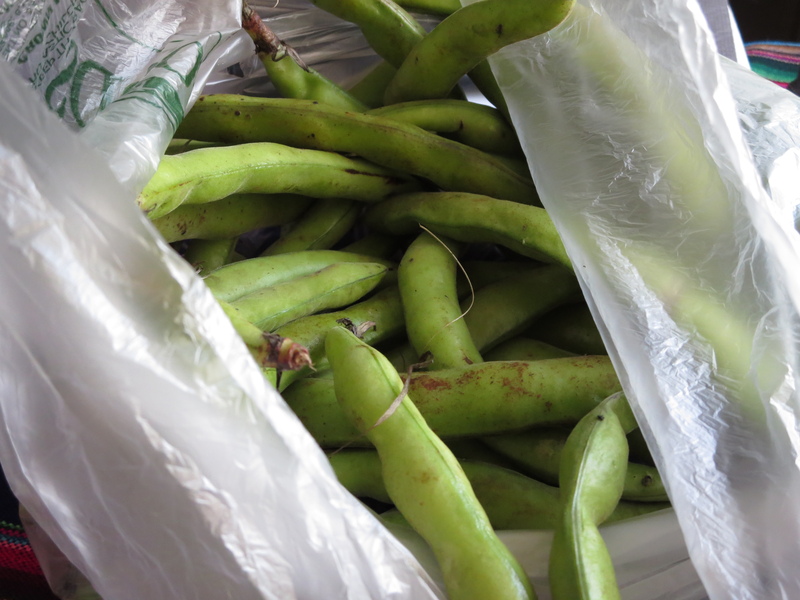 I thought it called for 1Ib of fava beans and duly bought these up in a local store along with all the other ingredients. Chopped shallots, home-made croutons, a bit of fried ham and fresh mint go in the bottom of the bowl and the soup is poured over the top. Substantial and hearty. After I’d painstakingly shelled the beans I was a bit concerned that the tiny bowl of beans I was left with could possibly make a decent amount of soup. Correct. It was Scott who pointed out that perhaps the 1Ib referred to the beans after they’d been shelled. 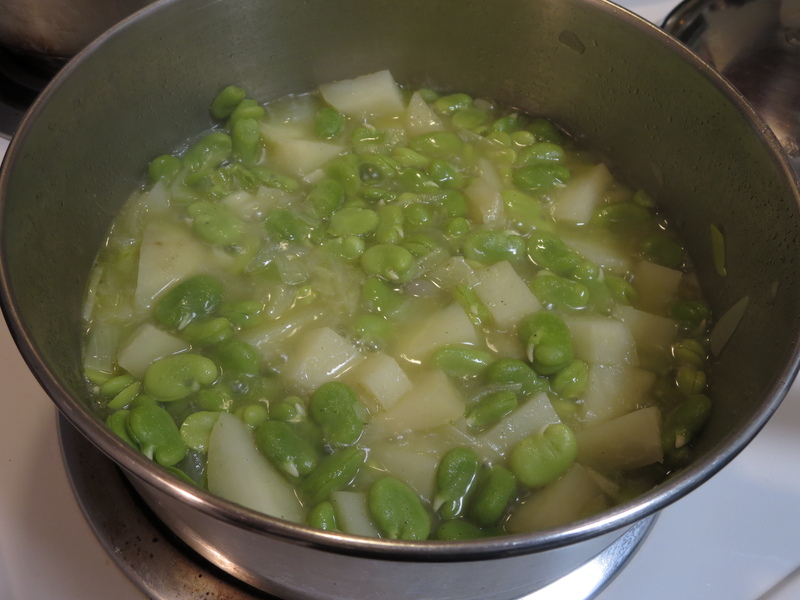 Looking again, I was slightly appalled to see that to get that amount I would need 4 Ibs of unshelled fava beans. Heroically Scott headed back to the store, literally bought up the remaining beans (the cashier apparently said they weren’t a popular item and he’d basically bought up all they would probably have in for a while) and then spent the next hour sitting with me helping to shell the damn things. Not only do they have to be popped out of their pods, but they have a fibrous coating around each bean which is best to take off. In the end it was a success, of kinds. Perhaps without the raw shallots and mint next time, and helping hands roped in to help are a must. It wasn’t Art, as my tongue in cheek title suggests, but it was satisfying. some cream cheese and mint on top, ta da!